You'll see your comment on this page as soon as we've reviewed it. 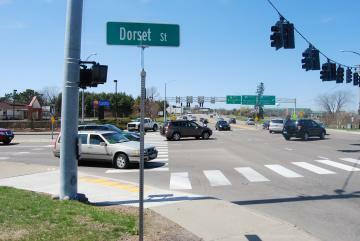 This is a photo of the intersection at Dorset and Williston. Highway signs are visible in the back of the photo, leading to Winooski, Burlington, St. Albans, and Montpelier. Many cars line the streets as this is a high time of traffic, and a comfort inn sign can be seen in the left part of the picture. crosswalks have been added for pedestrian safety, and more road signs have been added to the area.